We all want our children to not be afraid of water and to learn to swim early, not only for their safety but also for their enjoyment. This is why swimming lessons are growing more and more popular. 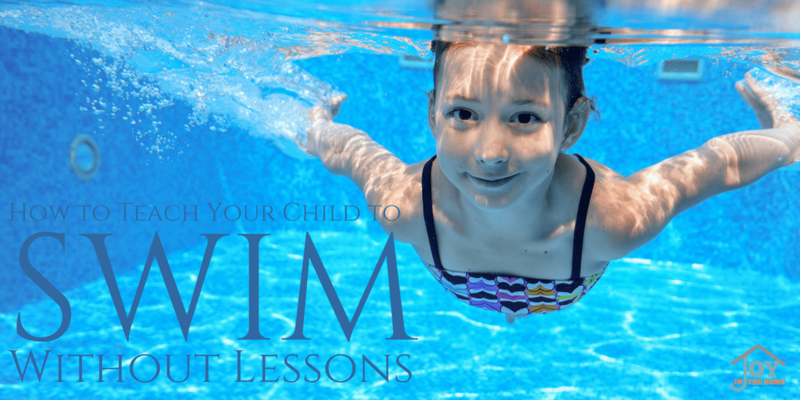 Not everyone can afford swimming lessons for their children or after reading this post, you may not want to take the lesson route. None of our four children have ever had swimming lessons, yet how they learned all seemed different and at different ages. 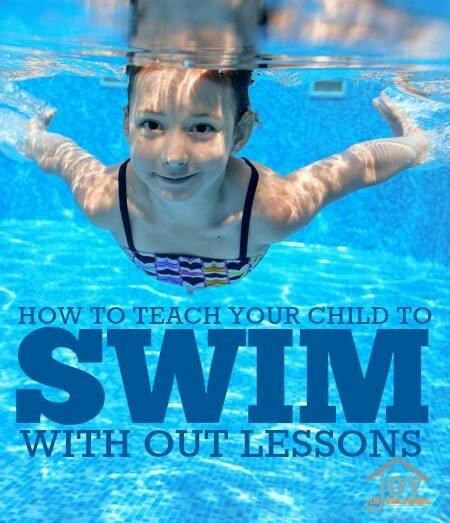 When I taught our last child to swim at four years old, the youngest any of our children to learn this life skill, I realized that this was something more parents need to know about and enjoy teaching their child to swim, on their own. I will be transparent with you, at the beginning of the summer that I taught our son to swim, I almost put him in lessons because he didn't fear the water and I was thinking it was going to take all summer long to teach him and was nervous of what could happen if I didn't put him in lessons. Imagine my surprise that within one week of my husband and I talking about putting him in lessons, he was already ‘swimming' in the kids pool and within two weeks after that, he was jumping off the diving board into 9 feet of water. 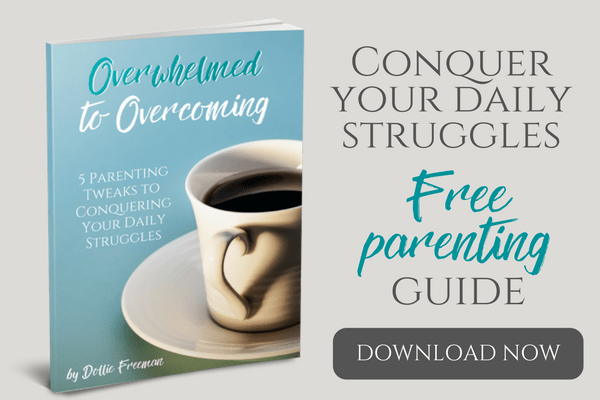 These steps work and they are so much fun to do with your child, who will trust you more than they would a stranger, which is why I believe they make a lot of sense. The first thing that I realized when our youngest was a newborn was that my reactions when my children were in water was what turned them into fearing water. Babies are not born afraid of water, as it is a natural feeling for them and it is proven that babies can easily hold their breath under water and can even swim. This is when I realized that my reaction of when water was on my children's face, when they slipped under water in the tub, or when they were splashed and didn't realized it was coming was all creating a reaction in their own mind that water was to be feared. I avoided this reaction with our youngest and he was our first that loved to be in water. He never cried when he slipped in the tub, but would rather clap his hands with me, as I praised him that he was learning ‘how to swim' like a big boy. He loved to have water poured over his head and loved to splash in the water and be splashed. So the first step to teaching your child to learn to swim is to help them love the water. If they already have a fear of water, you will need to work harder but you can still do it. I know because our older three had fear and all of them are excellent swimmers. Give your children time to play and learn to enjoy water but giving them a lot of time to play during their bath time. At a young age turn their small pool into a fun learning place that will make them see that water can be fun and not scary, even if they already have a level of fear, they will learn to relax with the destruction of play things in their pool. As they begin to get more comfortable, increase the amount of water in their little pool. 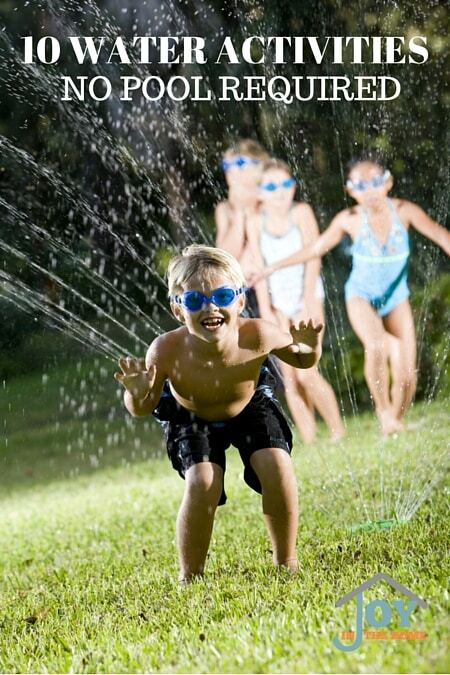 Many children do not like water in their ears, which can lead to painful swimmers ear. 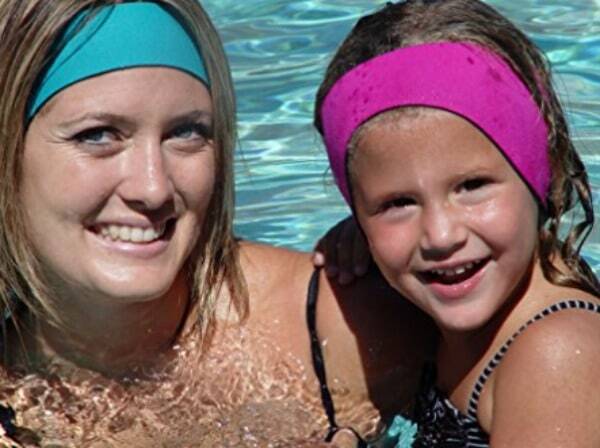 These Ear Band-It work for all ages, and increase the fun in water without the risk of ear pain later. There are a lot of products on the market that are for flotation, but there is only one that I feel will help your child learn to relax and enjoy the water, and learn the true buoyancy of the water and that is the Puddle Jumper. This one flotation device that is approved by the US Coast Guard is the only thing that I know made the biggest difference for our youngest child. My favorite thing about the Puddle Jumper life jacket is that it will roll a child over, eliminating the face down dangers of many of the other flotation devices on the market. However, when a child first wears this, they must learn how to ‘balance' themselves in the water with this device. This step doesn't take long to master, as long as you give your child the space to learn it and that means ‘letting go of them' while they are in the water. Once a child learns the skill of keeping up right in the water, the puddle jumper will give them the confidence to do what kids do best… imitate others. They will begin to kick their feet and move their arms, to try to be like the swimmers around them. The Puddle Jumper grows a child's confidence so quickly that they will believe they can swim, even without it. It is very important for the child to understand that the buoyancy is coming from the device and not their skills, which is a great time to start training some of those necessary ‘swimming skills'. During this phase for our son, we would go in the 2 foot area of our local pool and take off the Puddle Jumper to let him practice some of the arm and kicking that he would do with it on. One time, we didn't say anything and just watched him. This time, he just acted like it was on and went under the water. He quickly came up with a shocked look on his face and we were all clapping and cheering that he was starting to swim. That was the day we started his lessons. When starting focused lessons, I would suggest starting with learning how to hold their breathe. This is a picture of my four year old, when he was learning to swim. Blow bubbles in the water – We would often have fun with blowing bubbles at the surface of the water, just to get our child use to have at least their chin in the water with an activity that can be fun for you to do together. You do this by vibrating your lips together to make a motorcycle type of a sound. The water will move with this action and the child will love it. Blow in the face of your child – Teaching your child how to hold their breath without having to physically close their nose is as easy as blowing in their face. If you child is younger or not afraid of the water, you can even put them under the water after blowing in their face, as the natural reaction is to hold their breathe. This method is a great way for them to learn to do this on their own when water comes close to their face. Holding their nose – Of course, if you child is older and already dealing with fear about water, the trick of holding their nose closed with their hand. They can practice this with putting as much as their face as they prefer under the water. Jumping into the water from the side of the pool – The Puddle Jumper is a great flotation for a child to learn how to jump into the pool and it can serve as a told to teaching them to hold their breathe because in our experience, our son held his breathe each time he jumped into the water, and he would go completely under the water and then the flotation brought him up quickly. Once your child has these key things learned, it is time to focus on actually teaching swimming. Remember that children are natural imitators and why not use that as part of your swimming lessons. Have older children, who know how to swim already, and avoid being surrounded by non-swimmers or children afraid of the water, because children are natural imitators and this can be what they they choose to imitate verses the swimmers. During these lessons, you will want to put the Puddle Jumper away. The only thing you will really need is a pool that is either at the level of the child's upper chest/chin or just over their head, but not over your head. Start with ‘baby steps' by having them hold on the wall or another person and swim to you any way they can. This should be really close at first and the more the confidence grows the further distance you can provide. You will want to focus on helping them learn better ways of swimming, like kicking their feet and moving their arms in the water. 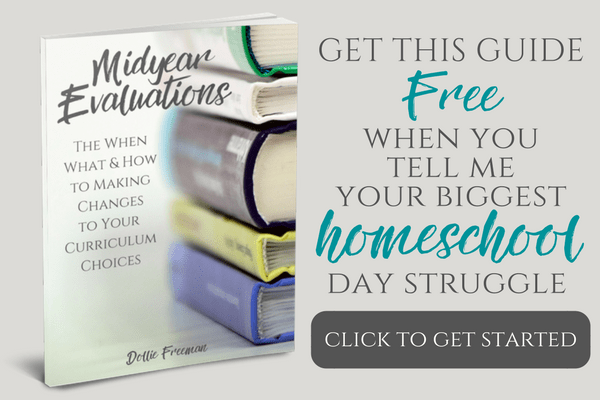 Make these lessons fun and don't make them too long. If you are going to be in the water for 1 hour, have the first 5-10 minutes of fun, then turn the next 5 minutes working on kicking while the child swims to you. Then have them swim back to the wall or the person helping you. Repeat this for that time period. Then go back to having fun. Next, work on going under the water to swim with kicking (building on what you already focused on) for 5 minutes. Enjoy the pool for another 5-10 minutes. Then come back and work on the arm movements for 5 minutes, moving back further (providing more space between you and the learner) to see how the first two lessons are helping. Always make the lessons fun and trying to stretch your child to push themselves just a little more than what they did the last time. Have them look back to see how much they did and celebrate together. 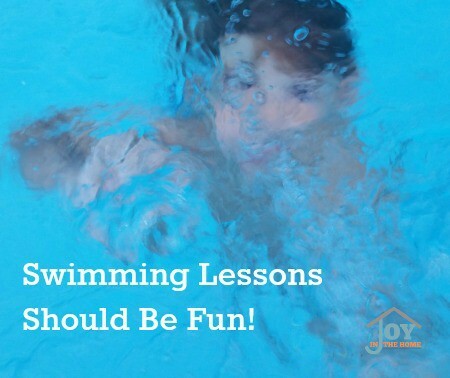 I hope these tips give you the confidence and ideas to teaching your child to swim without lessons.